Chucky Goes to Space in Child's Play 8? The Child's Play franchise is one of the most enduring horror franchises in history. Even if horror fans may not think of Chucky in the same way that icons such as Freddy Krueger, Michael Myers and Jason are regarded, the murderous doll has proved that he can endure. So what's next for the series? 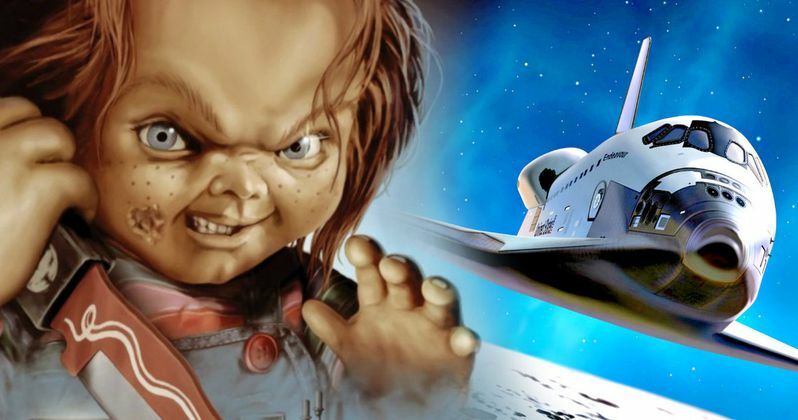 Well, if Child's Play creator Don Mancini is to be believed, we could be seeing a Chucky in Space movie. Don Mancini is currently starting to promote the upcoming Cult of Chucky, which is set for release on October 20, 2017. While speaking with Joe Lynch and Adam Green on The Movie Crypt, the director revealed that he actually has an idea to bring the Child's Play series, quite literally, out of this world. Here's what he had to say about it. "I have an idea for Chucky in Space. You know how sometimes, like, kids will present a space shuttle crew with like, some totemic experiment or mascot or whatever? Chucky...Chucky in Space." Don Mancini may or may not be joking about this, but we have to assume that there is at least a nugget of truth in there somewhere. Also, not for nothing, but that isn't the worst idea when it comes to the Child's Play movies. Just rewatch Seed of Chucky. And would it really be that outlandish to bring Chucky to space? Jason X proved that the Friday the 13th franchise can work (sort) of in space and the Leprechaun and Hellraiser franchises have gone to space before. So why not Chucky? This isn't exactly a horror series that takes itself seriously over the years. It could work. Maybe not on a direct-to-video budget, but it could work. As far as Child's Play is concerned right now, Cult of Chucky looks like it is going to be the culmination of everything that has happened in the franchise up to this point. Not only is the Don Mancini back as writer and director, along with Brad Dourif as Chucky, but Alex Vincent is also back as Andy, who the doll has been terrorizing since he was a little kid in the 80s. It also looks like it will be bringing the franchise back to its slasher roots a bit, with the movie taking place in an asylum. Plus, Jennifer Tilly is back as Chucky's bride Tiffany. The original Child's Play came out in 1988 and Chucky has been around ever since with a new movie every few years or so. If Cult of Chucky does well enough, maybe we could actually see this kind of ridiculous but maybe fun Chucky in Space movie as Child's Play 8? Stranger things have happened but we still have to think this is ultimately very unlikely. Maybe we'll know a little more after Cult of Chucky comes out and we see where all of the characters stand at the end of that slaughter festival.